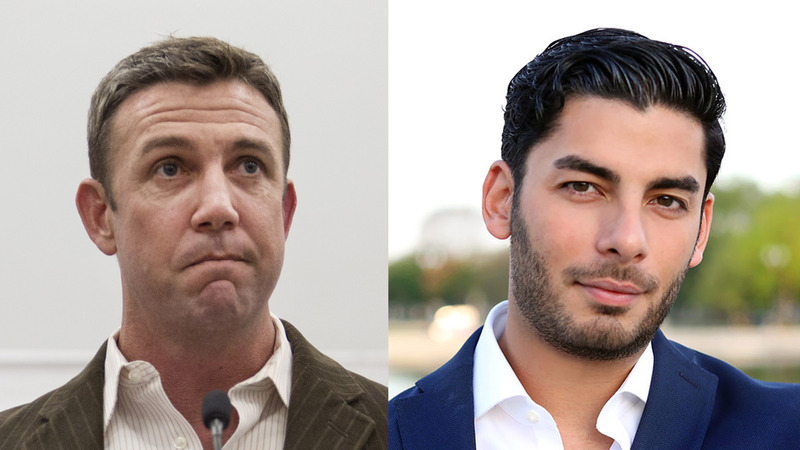 Challenger Ammar Campa-Najjar predicts he’ll defeat Republican incumbent Duncan Hunter in their 50th Congressional District race Tuesday. Unless he resigns or is removed by House colleagues, Alpine resident Hunter would remain in office until the end of the 115th Congress if he loses Tuesday. The 116th two-year Congress is set to begin Jan. 3, 2019 — exactly a month after a Dec. 3 hearing in the Hunters’ campaign finance violation case in San Diego federal court. The Democrat’s campaign didn’t immediately respond to questions about its suggestion Hunter would exit early. Is Campa-Najjar being smart — doing a victory dance before ballots are cast? Longtime local politics observer Carl Luna says the letter, at best, may result in a few more Democrats coming out to vote. But a potential downside exists. Is the letter’s pitying tone a good or bad thing? “There’s a fine line between ‘pity’ and ‘snarky,'” Luna said via email. “The letter tries for the former but critics may read into it the later. The latest poll on the race — ending Oct. 29 by KGTV-TV and SurveyUSA — found Hunter leading Campa-Najjar by 3 percentage points in the heavily Republican district of East County and southwest Riverside County. But the margin of error was 4.8 percent, meaning the five-term Republican could win by 7.8 points or lose by nearly 2. When I first decided to run 21 months ago, I was looking forward to having a respectful but robust debate with you. I’ve attended 20 town halls and 5 debates. You’ve attended 0. If you have nothing to hide, you’ll show up and debate me today. None of us choose our family, all of us choose our congressman. Instead of being your own man, you had your father confront me at a press conference. Neither of our fathers are running for Congress. For this reason and so many others, I believe you are unfit to serve. In all honesty, Duncan, I sincerely wish you well in life. After tomorrow, you’ll be relieved of your duties as congressman. It gives me no pleasure knowing that you’ll likely face time in prison for what you’ve done. Quite frankly, it saddens me. But the law is the law. I will not be rejoicing over your court hearing on Dec. 3, and anyone who celebrates a guilty verdict will be met with condemnation by me. Let justice run its course. While we were adversaries, I am my brother’s keeper. I hope and pray that one day you’ll continue to serve as a private citizen and find meaning and healing in the process. As your next congressman, I promise to be there for you if you need me. As a Marine, you fought the battles we wage abroad so someone like me can have the luxury to fight the ones we have at home, of which there are many — from income inequality to healthcare. I promise to continue to fight with the same courage you once had. Your fellow countryman — in my heart if not in yours.